Are you involved with an animal shelter, pet rescue, or humane organization? Most people think about publicity in the context of bringing people to events or raising money. But publicity can bring you other benefits as well. You can use simple and affordable publicity tactics to recruit volunteers, find foster families, and increase adoptions. Get practical advice, along with creative ideas, inspirational case studies, and examples of real press releases that will help you plan and implement your own publicity campaign. Publicity doesn’t have to be complicated, expensive or scary. Even if you’re a bit shy or introverted, using just a few simple publicity tactics, you can spread the word about the great things you’re doing to help the animals! 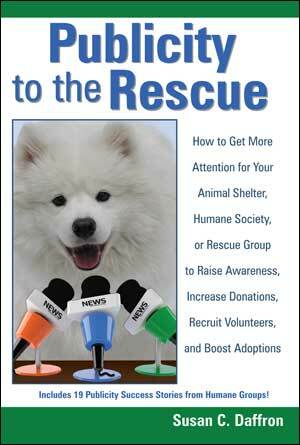 In addition to information and publicity tactics, Publicity to the Rescue also features 19 case studies of success stories from humane and rescue groups. 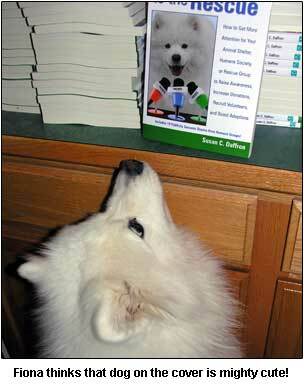 Check out this page and see the the organizations who graciously agreed to be interviewed for the book. Visit their Web sites and you’ll be inspired by the great work these folks are doing to help animals! Start Getting More Publicity Now! If you are curious what’s included in the book, check out a PDF file that contains the table of contents and the first 5 pages (126K). Note that because it’s a PDF file, you need the free Acrobat Reader to view it.